A recent interesting infographic on the history of Superman caught my attention. This may seem a little bizarre, but it got me thinking about the similarities between the evolution of this great superhero and the state of education. Check out the infographic then come back and let me rant for a few minutes. I love how every generation is treated to an updated and more relevant version of our favorite superhero, Superman. It was always so exciting for me to tune in to another episode to see if today was the day that Clark Kent finally spilled the beans about his true identity. With all the changes that Superman has endured since the 1930s, some things continue to remain constant: His actions are always rooted in his deep belief in doing what's right and good. It reminds me of teaching and how we also need to evolve. 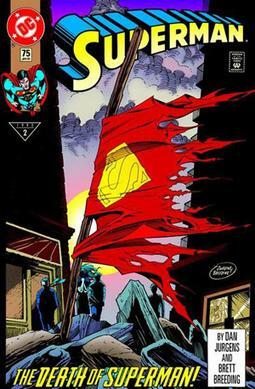 Although Superman almost meets his untimely demise on several occasions, he is mostly able to escape death in some twist of superpower and fate. Even when Superman DID finally succumb (in 1992), the writers found a way to bring him back and tell the story in new and more interesting ways. Like Superman, in education there have been cycles of life for a variety of fads strategies that were whole-heartedly adopted. (Can you say, "Inventive Spelling," "New Math," "Whole Language," or "Open Classrooms?") Each era brings new challenges and somehow we manage to adapt and keep Superman alive. We just tell his story a different way. The message that keeps us coming back is that of hope. No matter how dim things look for him, there's always a way to pull him back and he'll be stronger than ever. Good always wins over evil, right? or does it? I'm afraid that this generation is going to finally see "Superman" die. I'm afraid there are limited resources with which to continue to resurrect what kids (used to) love about school. The assessment and accountability state of affairs, along with the fact that most teachers are now fearing for their livelihoods if their students don't bubble in the correct answers, is too often making educators challenge their own sense of ethics; causing good people to do bad things. The litigious nature of parents forces policy makers to base decisions on what will be best for school systems, avoiding what's actually best for students. I fear that things are going to get worse before they get better. Perhaps we need Superman to really die in order to realize what he was to us. Perhaps we need to have education bottom-out, before something drastic is done to bring it back to life. And yet, I worry that it will be too late. Does anyone care about Superman our kids anymore? I understand what you mean. Where has the "hope" gone? I think the American public has lost the concept of "hope" because it has been grossly misused. Superman does exist! We just need to find him again. Perhaps he will come flying in at the very last moment, right before tragedy strikes. Great article! The link below is one of my favorite graphics of how we are not meeting the needs of every student, despite the re-cycled trends in education. We need Super-administrators and Super-educators who are allowed to focus on teaching instead of focusing on how to measure all learners on the same level.